I want to summarize and synthesize some of what I discussed in my previous posts (Intro sentence). While researching for this blog, I learned that people in ancient Greece wore clothes made of hand-spun fabric (wool or linen). These often took the form of sheets or blankets, and then they were folded into fashionable dresses and tunics. This made for a loose and figure-flattering silhouette for both men and women. This made me wonder how fashion connected to the Greeks' body image. Although I still don't have a definitive answer to this question, I had some hypotheses: the weather in mainland Greece made it so that this clothing was necessary to stay cool and healthy, and the Greeks may have subconsciously wanted to cover up imperfections with their loose clothing (Brief summary of previous posts). Examining fashion is very important because it allows us to understand the culture and mindset of the people who wore the clothes--in this case, the Greeks (Importance). 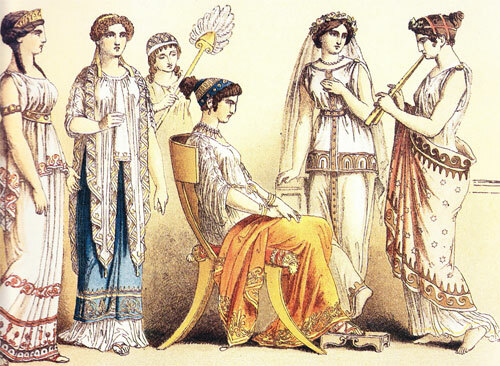 In addition, many ancient Greek garments and accessories have influenced our fashion today. In the modern world, issues of body image and clothing choices are very prevalent in fashion journalism (Connection to world today). I hope to return to this blog later to continue to explore Greek fashion, and maybe start to discuss modern fashion as well! It's not my image, but I believe it's in the public domain so you should be safe!